Once limited to the static brick-and-mortar casinos, the gambling industry has evolved to offer its services to players anytime and anywhere. Such a development has presented governments with new challenges when it came to creating and enforcing respective legal requirements, as well as protecting players from being exposed to bad industry practices. The list bellow offers an overview of major players in the gambling regulatory business, the ones you’re most likely to see when entering a new online casino. If the gaming venue you’re about to join does not display a license issued by one of the more reputable regulators, you should think twice before surrendering your hard-earned cash to that particular operator. Nevada legalized gambling in 1931, and while casinos were obtaining licenses from the Nevada Tax Commission, enforcement was lacking. The 1955 Legislature created the Gaming Control Board, its primary purpose being to “protect stability of the gaming industry through investigations, licensing, and enforcement of laws and regulations”. To obtain a gaming license, casinos must adhere to rigorous standards and will experience hefty fines if they don’t comply. DGE was established in 1977 with the mission to maintain a legitimate casino gaming industry and assure the honesty and integrity of casino owners and operators. The Division conducts investigations of all license applicants and reports to the Casino Control Commission (CCC) which has the authority to grant or deny a license. They have created a high-tech security network to identify and stop illegal online gamblers, those being users outside of New Jersey, from crossing the border. Internet gamblers don’t have to be New Jersey residents, but must be physically present within the state in order to play. Gaming industry believes that the Division has overregulated the market and forced some qualified operators to leave due to strict applications and investigative process. However, their licensing standards offer players an assurance that a New Jersey license holder was subjected to a thorough approval process and complies with strict regulations which protect gamers’ interests. Kahnawake Gaming Commission is the official licensing and regulating authority for gaming activities within this Mohawk Territory. The Commission has enacted regulations concerning online gaming in 1999, with basic principles being to ensure interactive gaming is conducted responsibly, that players are treated fairly and winners payed promptly, and that all information related to player accounts is held in the strictest confidence. The Commission also provides various dispute resolution mechanisms to handle player complaints, including the possibility of third party arbitration. Gaming industry is in Panama controlled by Junta de Control de Juegos (Panama Gaming Control Board), established in 1947, and all Internet gaming companies in Panama have to be registered under the online gaming act of 2002. The regulation allows for online international wagering, and as long as the income made from online operations is from outside Panama, there is no income tax, withholding tax, sales tax or VAT tax. Since the passing of the aforementioned online gaming act, this relatively small regulatory body has built itself a somewhat dubious reputation. While you’ll find a number of credible operators working with a license issued in Panama, there are also those which have been in the centre of major scandals, such as the one which involved cheating done by employees of UltimateBet.com. The UK Gambling Commission was set up under the Gambling Act 2005 in order to regulate commercial gambling in Great Britain. Basically, any gambling operator who wishes to recruit British members, has to obtain a license issued by the UKGC. Their objectives are, among others, to ensure that gambling is conducted in a fair and open way, and children and other vulnerable persons are protected from being exploited by the industry. The Commission regulates operators who provide arcades, gaming machines, lotteries, bingo, remote gambling (online, telephone), casinos and gambling software. They will not resolve consumer complaints and can’t help you get your money back, but they do require licensees to have procedures in place for handling complaints, and will occasionally review cases to ensure the operator has met its license obligations. Thanks to rigorous standards and procedures enforced by the UKGC, having their approval goes a long way towards supporting online casino’s claim of offering a fair and secure gambling environment. Based in the British Isles, the Alderney Gambling Control Commission (AGCC) was established in 2000 with the aim to regulate eGambling industry and ensure that it is conducted honestly and fairly. Within the process of issuing an operating license, AGCC will assess the background of the operator, their internal operating procedures, fairness, security and auditability of the gambling systems, and also investigate players’ complaints. If you happen to be an aggrieved player who has not received a satisfactory answer after having made a complaint to the licensee, you can contact the AGCC for arbitration. They will communicate with the operator in question and propose a resolution. However, experiencing unresolvable problems with gambling sites which use Alderney license is extremely rare, so joining one that does hold it pretty much means your interests will be well protected. Malta was the first country to regulate online gambling and as the result now hosts about 10% of the world’s online gaming operators. The Malta Gaming Authority (MGA) is a regulatory body responsible for the governance of online and land-based gaming activities in Malta and regulates most forms of betting, except for horse racing and spread betting. Their activities include conducting research on various aspects of gaming, granting gaming licenses and monitoring gaming operations. Players who experience any difficulties with an online or land-based operator licensed by the MGA have the option to reach out to their Player Support Channel. Having received a complaint, they will either investigates it directly or refer it to the relevant licensee. Malta’s regulations are known to be strict and structured, which is a good indicator for a gamer thinking of playing at an MGA-licensed online venue. ARJEL is an independent authority created by The French Gambling Act in 2010 with the aim to regulate online gambling in France. Their responsibility is to issue licenses and ensure compliance by the operators, ensure safety and fairness, and fight against addiction, illegal sites and fraud and money laundering. France’s regulated online gambling market has been continuously criticised due to its high rate of taxation, the primary driver of operator losses, as well as limited wagering options. Since the regulated market was launched, French-licensed operators have reported a loss of close to €500m. Last year a new bill was passed overturning the 2010 decision to restrict the player pool to those gaming within the state’s borders, which has proven to have negative repercussions on French poker operators. While the initial decision was aimed at protecting players, some recent cases indicate that even though the system has player fund protection mechanisms in place, this still doesn’t guarantee your money will be 100% safe. In recent years Italy has made significant efforts to move away from a total ban on all gambling activities. Gambling market was liberalised in 2006 by legalising real-money skill games and betting exchange, opening the Italian gambling market to EU and EFTA companies and providing the opportunity for online operators to legally offer their services to Italian citizens. Before they can do it, the operator needs to acquire an Italian license issued by The Amministrazione Autonoma dei Monopoli di Stato (AAMS). AAMS licenses cover skill games, tournament and solitaire poker games, cash poker games, casino games, fixed odd sports, horse betting, and bingo. Players looking for a safe online gaming venue should appreciate its stringent requirements, strict enforcement and harsh penalties such as blacklisting, heavy fines and even imprisonment. Gambling operations in Gibraltar require licensing under the Gambling Act of 2005, with the remote Gambling licenses, including telephone and Internet betting, issued by the Gambling Commissioner. Among others things, operators are required to have their gambling products and services tested and certified by one of the independent test houses approved by the Gibraltar Licensing Authority. They also need to have effective systems in place for receiving and managing customer complaints. Bank accounts into which customer’s funds are received and held are regularly controlled, and the licensee is obligated to have adequate financing available to pay all current and estimated obligations at all times. Until Spanish Gambling Act was passed in 2011, each of the 17 Spanish regions featured its own approach to regulating various forms of gambling within their territories. The new law has set national standards which are now applied across the country and include Internet gambling. 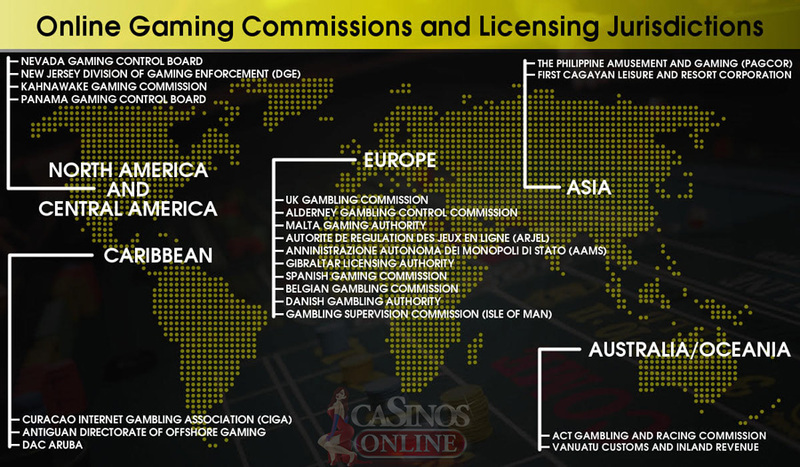 Comision Nacional del Juego has issued the first batch of eGaming licenses as late as 2012. While it maintains responsibility for the licensing process, it’s the Economy and Treasury Minis-try that establishes and enforces gambling regulation for each type of online gambling. When it comes to player protection, this regulatory body is considered to offer a moderate level of security. There is a ban on games of chance in Belgium, but since an absolute ban once resulted in an uncontrolled booming of illegal gaming, the government has implemented a policy to channel gambling activities by way of licenses. The Gaming Commission was created in 1999 and tasked with offering advice to the government and parliament, deciding on the granting or refusal of different types of licenses, and acting as a supervisory body. Protection of players is one of the Gaming Commission’s main goals. Since 2012, Belgian banks are required to block all financial transactions from blacklisted sites, and ISPs to block access to unlicensed sites. Belgian players gambling at blacklisted sites are considered to be committing a crime and will pay hefty fines if caught. So, if you are a resident of Belgium, make sure to review the blacklist before registering to a new online gaming venue. Danish Gaming Law has entered into force in 2012, with the goal to liberalise and modernise the Danish gaming market. The Danish Gambling Authority is an independent government agency responsible for securing a regulated gambling market and ensuring that players are protected against unfair and illegal gambling. It consists of four units, namely Policy and Finance, Licencing, Compliance and Landbased Gambling. Following the example of the Belgian Gambling Commission, Danish Gambling Authority has also put in place a notorious blacklist, causing many online gambling companies to argue that the blocking of their sites violates the EU’s jurisdiction over gambling and free markets. The Gambling Supervision Commission (GSC) was established in 1962 and, in addition to licensing and regulating land-based gambling operations, it also regulates online gambling activities. Their core responsibility is to keep the gambling industry crime free, protect those at risk, and ensure that services offered by license holders are fair and that players receive their winnings. For gamers who experience an issue with a GSC-licensed operator, there is a direct channel of communication with the Commission who will assist in getting the complaints resolved relatively quickly. In 2001, the Isle of Man Government was one of the first jurisdictions to introduce legislation designed to benefit gambling and e-gaming companies and has since been actively encouraging and promoting the development of gambling business on the island. Operating since 1996, Curacao is one of the oldest providers of regulated eGaming services. CIGA offers only one license type and their jurisdiction covers all forms of interactive eGaming, namely casinos, sports betting, exchanges, lottery, and games of skill and chance. This favourable jurisdiction, located in a low tax haven and offering all-in-one packages is highly attractive to operators. However, players should not count on enjoying a high level of protection nor assistance when it comes to their complaints. Operating since 1994, Antigua Division of Gaming is one of the very first jurisdictions to offer online gaming licenses. It caters to casinos that still accept US customers despite the US law, which might make you think they function in favour of operators more than the players. However, this regulatory body responsible for overseeing the offshore gaming industry in the jurisdiction of Antigua and Barbuda is UK whitelisted, meaning it imposes high regulatory standards and players can count on being well protected. Departamento di Asuntonan di Casino (DAC) is the authority granting casino licenses on Aruba, including those to online gaming providers. Operators can serve both local and foreign gamblers, and are not required to hold a casino license themselves provided they’re engaged in a “casino contract” with the license holder. While theoretically there are strict rules in place, Aruba has a reputation of being a bit lenient when it comes to enforcing them. PAGCOR is responsible for issuing licenses to operate casinos, traditional and electronic bingo parlours, electronic gaming outlets, sports betting kiosks and poker rooms. While the Gaming Licensing and Development Department sets regulations and guidelines, Compliance and Monitoring Department enforces the rules. When it comes to offshore gaming operations, it’s the duty of PAGCOR to make sure online games are properly regulated and monitored, and that no Filipino is able to place bets. Foreign nationals, while on Philippine territory, are equally not allowed to participate in the online gaming activities organized by a license holder. First Cagayan is the Master Licensor for internet gaming in the Cagayan Special Economic Zone and Freeport which operates as a separate customs territory. Thanks to its strategic location between the Pacific Ocean and South China Sea, the Zone is considered to be “Northern Philippines’ gateway to Asia and the Pacific”. The Cagayan Economic Zone Authority has created an environment for internet gaming independent from any government agency including PAGCOR, and positioned the Cagayan Freeport as the most attractive jurisdiction for operators thanks to a competitive licensing regime. At the same time, they ensure that their regulations and policies offer high levels of player protection. Gambling in Australia is regulated at two levels, the central government and several regional authorities. Established under the Gambling and Racing Control Act 1999, The Australian Capital Territory (ACT) Gambling and Racing Commission was given the responsibility to provide administration of Acts related to gaming machines, casino, lotteries, bookmakers and racing. Casino regulation ensures that the casino is free from criminal influence, gaming activity fair, and casino administration, finance and security operations conducted according to the approved control procedures. Checks carried out by both the Commission and the Australian Federal Police confirm the integrity of operators issued with a license. The Interactive Gambling Act passed in 2001 made it an offense to provide real money online gambling services to Australian citizens. They can still access them, though the sites they can use are not regulated within Australia, and no help will be available from the Australian gambling authorities should they experience any problems. The idyllic island of Vanuatu is located in the South Pacific, just off the North East coast of Australia. Its government approved online gaming as far back as 1999, with the Interactive Gaming Act passed in 2000. The licensing process is under the jurisdiction of the Finance Ministry and the Department of Customs and Inland Revenue. Operators seeking Vanuatu license undergo stringent testing, and once having obtained it, they are requested to provide monthly reports to make sure that player funds are managed correctly. Software used must be independently audited and random monthly checks ensure that only the approved version is being operated. Along with a good reputation when it comes to player protection, this location is highly attractive to online gaming operators due to low tax rates and annual fees.